Les Miserables? Have I read Victor Hugo’s novel? Rather like Tolstoy’s War and Peace, the answer is no. Have I seen the stage play? I didn’t think so, but my wife says we saw it together, many years ago (and though I am sure that particular perfomance was great, it clearly was not that memorable. For me, anyway). 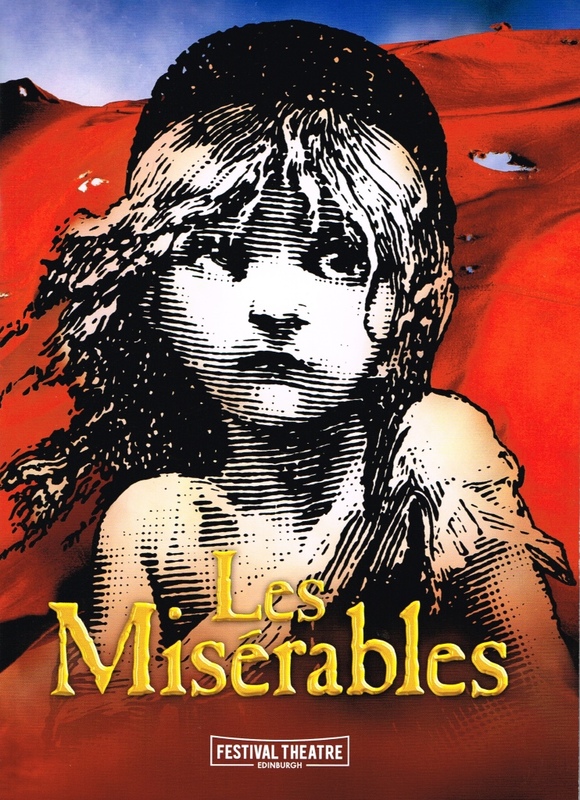 I saw Les Miserables again last night, at Edinburgh’s Festival Theatre*, courtesy of my daughter-in-law who bought (very expensive) tickets. Would I have gone otherwise? Probably not. I have run out of superlatives to describe last night’s performance. I have commited the crime of having used the word “stunning” so many times in the last few years that there seems to be nothing left. My Thesaurus suggest ‘breathtaking”, or “splendid” (now there’s a word I haven’t heard for millenia). No, not splendid. “Outstanding”, is probably more appropriate. Superlatives have failed me again and I have to say that what I saw last night was stunning. Outstanding. Though I have seen some superb acting in the past, I have not seen scene changes and scenery like I saw last night (not that I am saying that the acting wasn’t just as stunning and outstanding, because it was). Standing ovations for all of them. I am not easily impressed. I was very impressed last night (but I’m guessing you know that by now). *Image: Edinburgh’s Festival Theatre. Please forgive me for ripping it off from my programme.